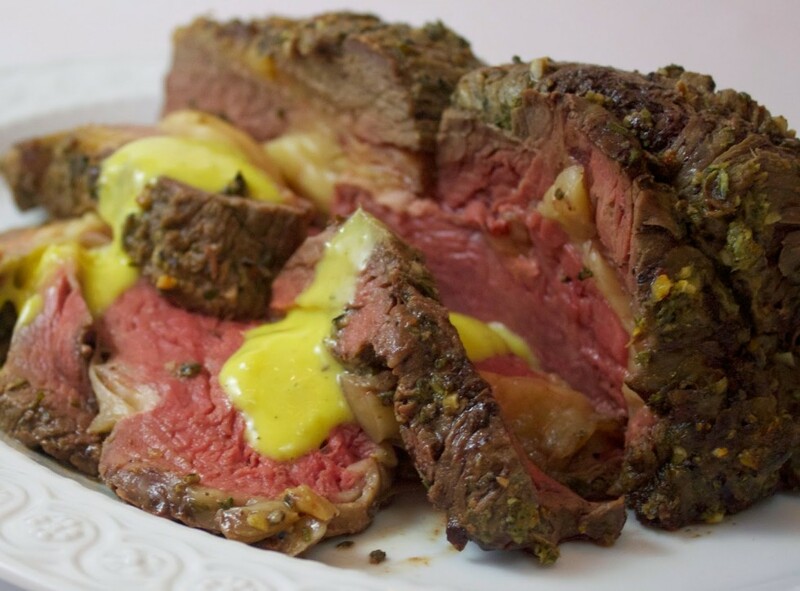 It must be a special occasion if prime rib – also known as a standing rib roast – is on the menu. The look alone of this coveted cut of meat is impressive, the sheer size indicating that company must be coming and the host is aiming to impress. This is not always the easiest cut of meat to obtain either as, given it’s reputation as a splurge for high-end celebrations, it is not always readily available. I was thrilled when the good folks from Foxhollow Farm informed me that they would be offering up small two to four rib versions of their grassfed standing rib roasts for purchase this holiday season. While still impressive, these three to four pound rib cuts are much easier to handle and are the perfect anchor to a special holiday meal for immediate family or the closest of friends. 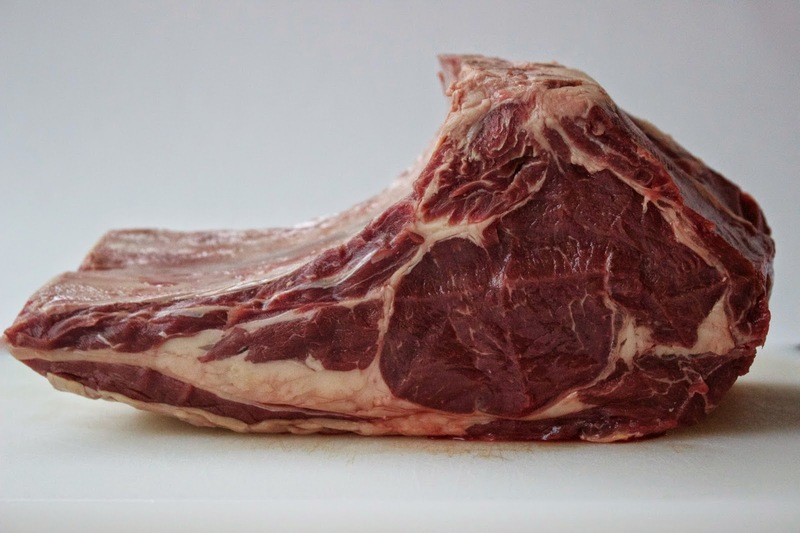 The marbeling of the beef ensures that each bite is rich with flavor and the bones, while removed for ease in cutting, are still cooked alongside, roasting away and imparting every bit of their distinctive character back into the meat. I took a few of my favorite things – fresh rosemary and thyme, loads of garlic, dijon mustard, spicy Foxhollow red pepper flakes and lemon juice – and coated the outside of the roast in an herb-driven crust, plenty of kosher salt and bourbon smoked pepper (found at Bourbon Barrel Foods) joining the mix to ensure that the beef was seasoned to the hilt. 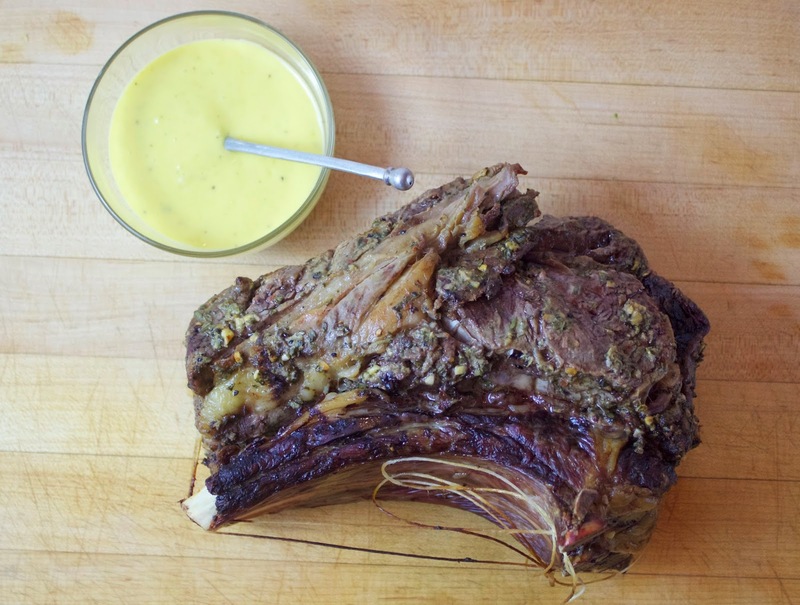 Served with a quick and creamy homemade garlic aioli, this roast will absolutely never fail to make a mark on the palate. Happy Holidays! Kentucky proud beef – looking the part! 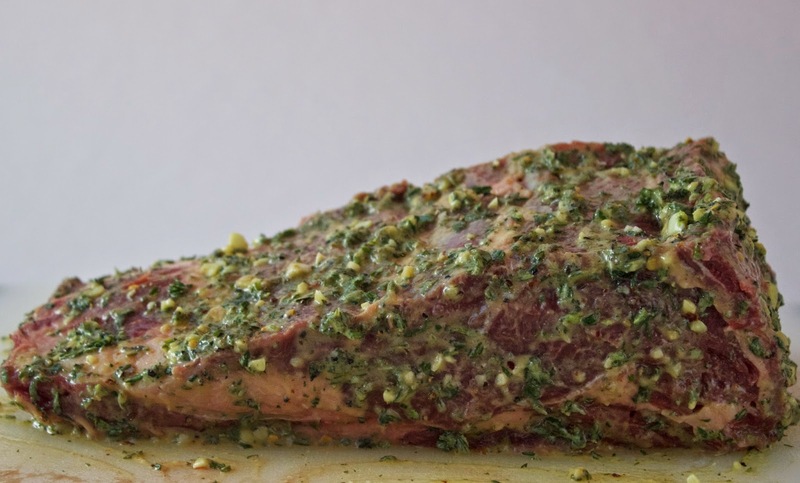 To begin, plan ahead a bit and remove the rib roast from the fridge at least one hour before cooking, ensuring that it comes to room temperature. Preheat the oven to 450 degrees. Combine the following in a small bowl: one and one half tbs minced garlic, two and one half tbs minced fresh thyme, two and one half tbs minced fresh rosemary, one half tsp red pepper flakes, two tbs dijon mustard, the juice from half of a lemon, one tsp Bourbon Barrel Foods bourbon smoked pepper, one tbs kosher salt and two tbs olive oil. Mix until well blended. I did a few test runs with the standing rib roast, keeping the bones intact as well as removing them. I will be the first to admit that my meat carving skills leave a great deal to be desired and, as much as I tried, removing the ‘chine bone’ as directed in nearly every prime rib recipe I researched, was no easy feat. I did come across one work around that seemed to do the trick – removing the rib bones and then re-attaching them to the roast, cooking them with the steak and keeping efforts during the carving process at a bare minimum. 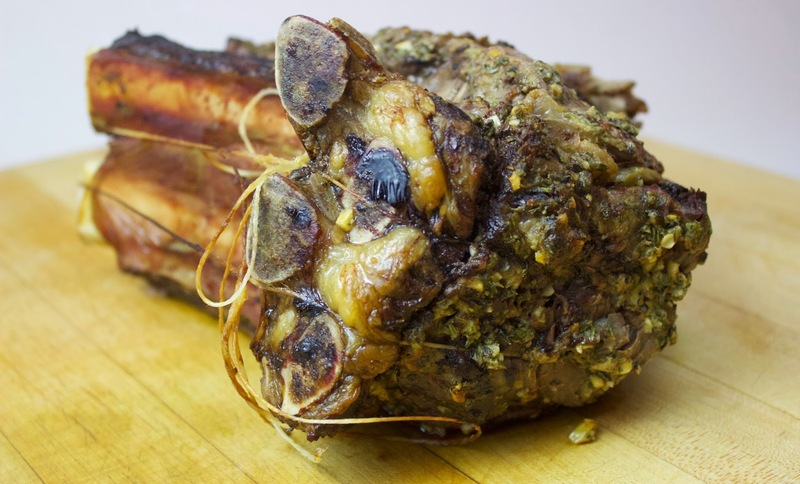 If you purchase your prime rib directly from a Butcher, you may request for the chine bone to be removed, which they can do so with ease given they have a large blade-saw handy (not a tool you will find in the foodie-girl kitchen…). Starting at the thin end of the roast, carefully slide your knife along the boneline, cutting to the top until the ribs pull away in one piece, nearly no meat from the roast removed. The bones removed, spread the herb-garlic-mustard mixture over every last bit of the beef, coating thoroughly and liberally. Take the rib bones and set them back on top of the roast, where they were originally located. Secure to the roast with kitchen twine and set in a roasting pan, just large enough to fit the beef but not so large that the juices will run far and burn to a crisp in the empty space. Place the standing rib roast in the oven and cook at 450 degrees for fifteen minutes, until the outside has begun to crisp up. Drop the temperature to 325 degrees and continue to cook for an additional 45 minutes to an hour, until the temperature of the roast reaches 125 degrees for medium rare – anything warmer won’t due this meat justice, in my opinion. Remove from the pan and tent with foil. Set aside and allow to rest twenty minutes before carving. While the meat is cooking, make the aioli. Now, I must warn you… this sauce is absolutely addicting. 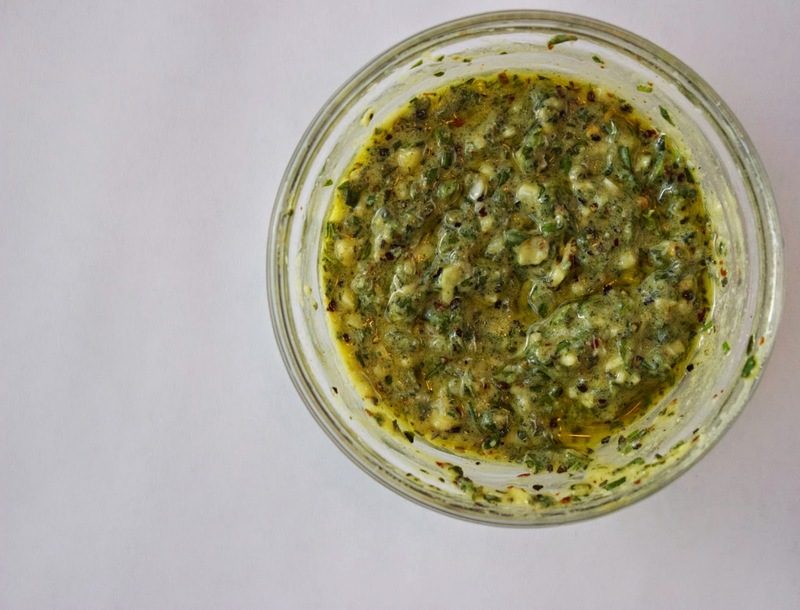 The simple combination of egg yolk, garlic, mustard and oil whips together in the most happy and ethereal way. You will quickly find yourself crafting all sorts of different takes on this classic, homemade mayonnaise. My current aioli recipe obsession comes from Gourmet magazine circa 2002 (RIP Gourmet!). Take two cloves of garlic and mince finely. Add a pinch of salt to the garlic and mash with the side of your knife, pushing and pulling into the garlic until it forms a paste. Set aside. 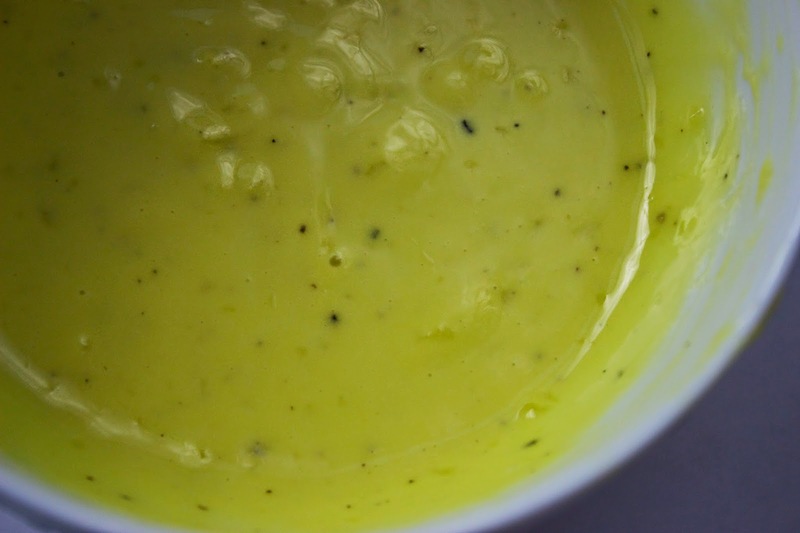 Combine the following in a bowl: one large egg yolk, two tsp fresh lemon juice and one half tsp dijon mustard. Whisk until well mixed. In a separate bowl, mix three tbs of vegetable oil with one quarter cup extra-virgin olive oil. Slowly add the oil to the egg mixture a few drops at a time, whisking well the entire time, until all of the oil has been incorporated. If the mixtures seems to separate along the way, simply stop adding oil and whisk until it pulls back together, then continue adding the remainder of the oil. Whisk in the garlic paste and add salt and pepper to taste. Transfer to a bowl for serving. Once rested, remove the rib bones from the roast and slice thinly, against the grain, from the top of the meat, where the bones once sat. Serve with the aioli alongside. Enjoy! 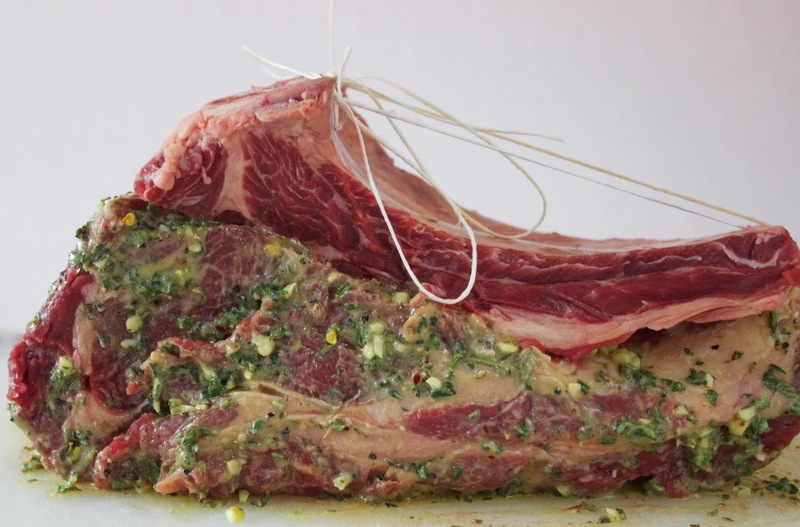 To begin, plan ahead a bit and remove the rib roast from the fridge at least one hour before cooking, ensuring that it comes to room temperature. Preheat the oven to 450 degrees. In small bowl, combine the garlic, thyme, rosemary, red pepper flakes, dijon mustard, lemon juice, Bourbon Barrel Foods bourbon smoked pepper, kosher salt and olive oil. Mix until well blended. Starting at the thin end of the roast, carefully slide your knife along the boneline, cutting to the top until the ribs pull away in one piece, nearly no meat from the roast removed. Take two cloves of garlic and mince finely. Add a pinch of salt to the garlic and mash with the side of your knife, pushing and pulling into the garlic until it forms a paste. Set aside. Combine the egg yolk, lemon juice and mustard in a bowl. Whisk until well mixed. In a separate bowl, mix the vegetable oil with the extra-virgin olive oil. Slowly add the oil to the egg mixture a few drops at a time, whisking well the entire time, until all of the oil has been incorporated. If the mixtures seems to separate along the way, simply stop adding oil and whisk until it pulls back together, then continue adding the remainder of the oil. Whisk in the garlic paste and add salt and pepper to taste. Transfer to a bowl for serving. Receive new recipes, travel tales and wine tips by subscribing via email!